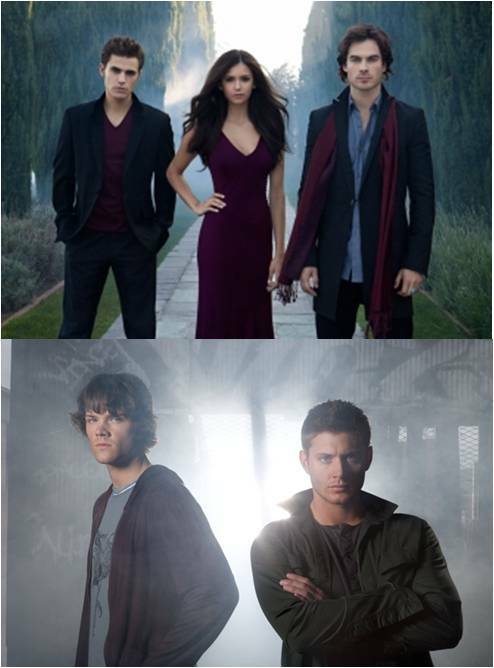 The Vampire Diaries renewed for Season 3..in surprise Supernatural gets 7th season! …Vampire Diaries, returning for a third round, continues to be the CW’s most-watched drama averaging 4 million viewers, and is its top show in the women 18-34 demographic (2.9)…. and SURPRISE! SUPERNATURAL back AGAIN! The arc that ended 2 years ago not getting in the way of the ratings! April 27, 2011. Tags: eric kripke, Ian Somerhalder, Jared Padalecki, Jensen Ackles, L.J. Smith, Nina Dobrev, Paul Wesley, Supernatural, The Vampire Diaries, TVD, Vampire Diaries season 3. Celebrities, Entertainment, Fantasy, Fiction, Horror, Mystery, Popular Culture, Sci Fi, Supernatural, Suspense, Urban Fantasy, Warner Bros.. 2 comments.